After jiva Gosvami, Baladeva Vidyabhusana was the greatest philosopher who appeared in the Gaudiya line. His outstanding literary legacy remains unsurpassed to the present day. There are no available historical records about his early life, however, those in his disciplic succession claim that he was born in a village near Remuna, in Orissa. Most scholars believe that he was born either at the end of the 17th century or at the beginning of the 18th century, and we know from a few manuscripts that his father was named Gangadhara Manikya. From his own statement at the end of his Siddhanta-ratna we know that he was a staunch follower of Madhvacarya's tattvavada. It is said that he strongly preached this philosophy all over India until he met Radha- Damodara in jagannatha Purl and became deeply impressed by his exposition of the sat-sandarbhas. Accepting him as his guru, he learned the philosophy of Lord Caitanya and received the name "Ekanti-Govinda dasa. Radha-Damodara eventually sent him to Vrndavana to learn Srimad-Bhagavatam from Visvanatha Cakravarti, who was then the leader of the Gaudiya community there and an exceptional scholar. In those days there was a dispute between the Ramanandis and the Gaudiyas regarding the method of worship of Govindadeva, the original deity of Rupa Gosvami. Govindadeva had been transferred from Vrndavana to the place which is now known as Jaipur to protect Him from the attacks of Aurangzeb. The Ramanandis allegedly complained to King Sawai jai Singh, who ruled from 1699 to 1743, that the Gaudiyas did not seem to be connected to a bona fide sampradaya, that they were worshipping Govinda before worshipping Narayana, and that the worship of Radharani was unprecedented and irregular. Upon hearing about the case, Visvanatha Cakravarti decided to send Ekanti Govinda dasa to Jaipur to respond to the allegations. There he invited all the opponents to a debate in which he refuted their objections and established that the sampradaya of Lord Caitanya was coming from the sampradaya of Madhvacarya. Yet one objection remained: the Gaudlyas did not have a commentary on the Brahma-sutras. That being the case, Ekanti-Govinda dasa promised to present a full commentary very soon. Spending the day in intense prayer, at night Govindaji appeared in his dream and directed him to write the commentary, which was completed in a matter of days and became known as "Govinda-bhasya." Having established the authority of the Gaudiya sampradaya and having received the title "Vidyabhusana" from the King, he went back to Vrndavana where he was appointed as the head of the Radha-Syamasundara temple, where he spent the rest of his life. At the end of the Aisvarya-kadambini we find the mention of the year saka 1701 (A.D. 1779). If the authorship of the book is correctly attributed to him, then Baladeva Vidyabhusana departed from this world by the end of the 18th century. 1. Commentary on the lsopanisad (the commentaries on nine other Upanisads are supposedly lost); 2. Aisvarya-kadambini; 3. Kavya-kaustubha; 4. Gopala-tapany-upanisad-bhasya; 5. Candraloka-tika (supposedly lost); 6. Chandah-kaustubha- bhasya; 7. Tattva-dipika; S. Commentary on the Tattva-sandarbha (the commentaries on five other Sandarbhas are supposedly lost); 9. Nataka-candrika-tika (supposedly lost); 10. Pada-kaustubha (supposedly lost); 11. Prameya-ratnavali; 12. Brahma-sutra- karika-bhasya; 13. Bhagavad-gita-bhasya (Gita-bhusana); 14. 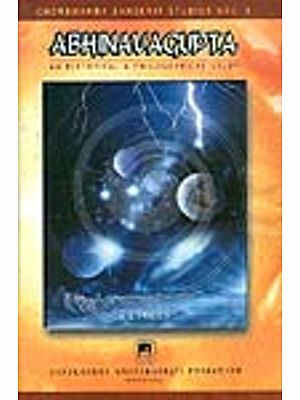 Laghu-bhagavatamrta-tika; 15. Visnu-sahasra-nama-bhasya (Namartha-sudha); 16. 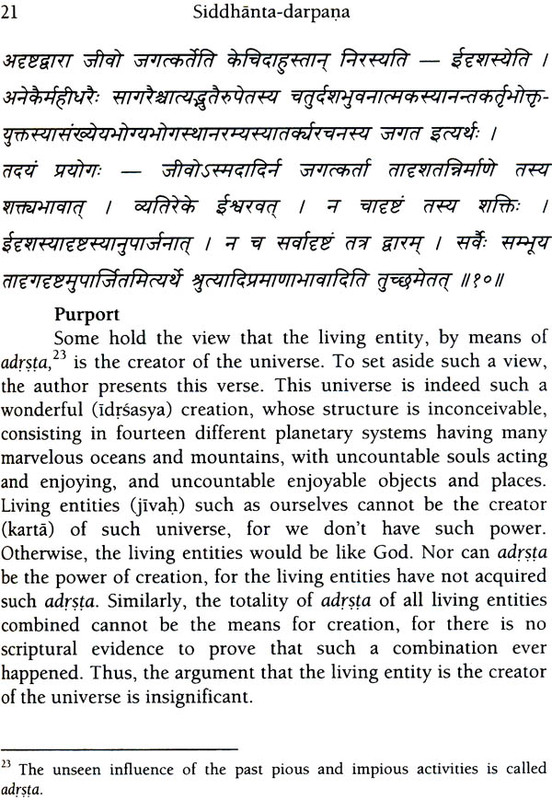 Vedanta-sutra-Govinda-bhasya; 17. Vedanta-sutra-suksma-tlka; IS. 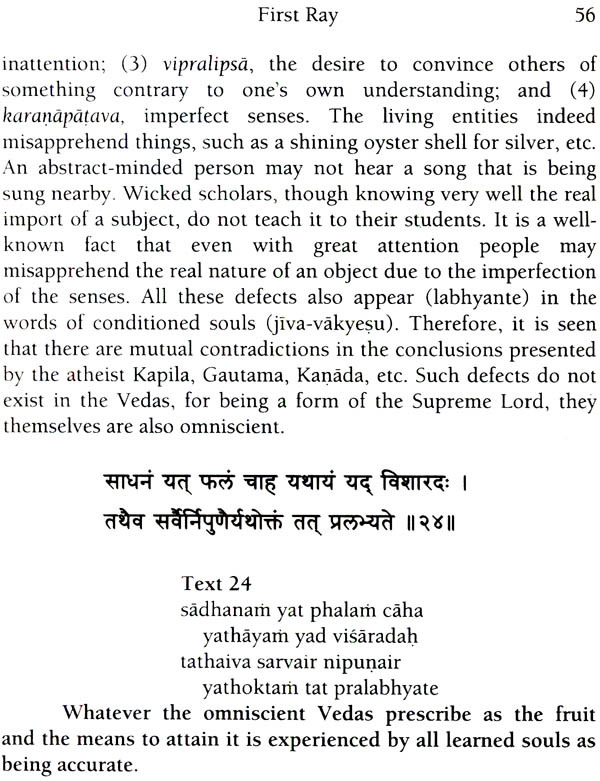 Vedanta-syamantaka; 19. Vyakarana-kaumudi (supposedly lost); 20. Sabda-sudha; 2l. Srimad-Bhagavata-bhasya (Vaisnavanandini) (Books 2-9 and 11- 12 are supposedly lost); 22. Syamananda-sataka-tika; 23. Sahitya- kaumudi; 24. Siddhanta-darpana; 25. Siddhanta-ratna; 26. Stava- mala-tika. Just as the supremacy of Lord Krsna is an object of timeless controversy, so is the authority of the scripture that depicts Him: the Srimad-Bhagavatam. No other Vedic personality and no other Purana has been so much attacked by opposing groups-a fact which itself evinces the superiority of both, for the scriptures often describe the particular envy the demons feel towards Lord Krsna. Such envy would be baseless if He were a common being and the Srlmad-Bhagavatam a common book. Therefore sastra, history, logic, and Lord Krsna’s exalted devotees stand by Him to dismantle all bogus texts, false evidences, fallacies, and atheistic arguments. With this in mind, Srila Baladeva Vidyabhusana, known as the Gaudiya Vedanta Acarya, compiled the Siddhanta-darpana, an original treatise that presents the Srimad-Bhagavatam as the sound incarnation of the Lord and defeats several objections against its authenticity. Yet there is a very old controversy in which the Saktas claim that the Devi-Bhagavata Purana is the bona fide Bhagavatam among the eighteen Maha-puranas. This issue has led to innumerable arguments between the disputants. Perhaps the earliest known reference to’ this controversy is that of Sridhara Svami (l4th century), who in the very beginning of his commentary on the Srlmad-Bhagavatam states that one should not doubt it as the authentic Bhagavatam, hinting that this controversy was quite widespread even in his time. 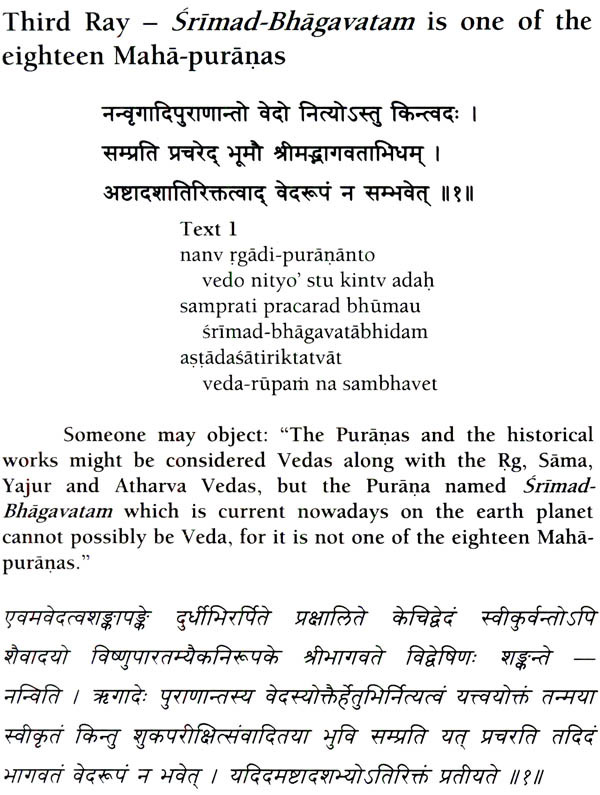 Narasimha Vajapeyi (l5th century) in his Nityacara-pradlpa quotes the list of eighteen Maha-puranas and declares that one should not think that the name bhagavata comes from bhagavati, another name of Devi, In addition, Vajapeyi mentions the view of Laksmidhara that Puranas such as the Kalika Purana, which are not in the list, are later productions. He further remarks that if one doubts the Srlmad-Bhagavatam, which is so famous, then one may well doubt the other Puranas too. 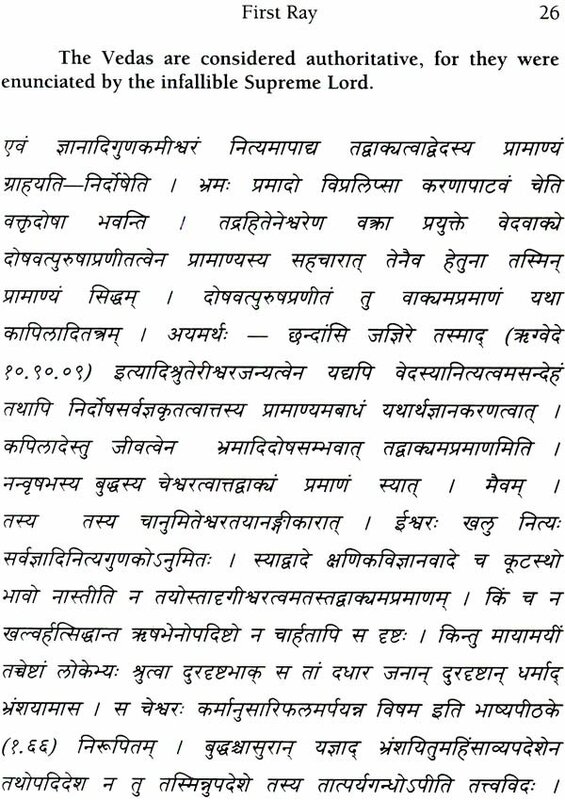 In the 15th century, Purusottama Ttrtha, a sannyasi in the line of Madhvacarya, wrote the Bhagavata-visaya-svarupa-sanka- nirasa-trayodasa, in which he presents thirteen arguments to prove the Vaisnava Bhagavatam as the legitimate Maha-purana. In the 16th century, jiva Gosvami composed the Tattva-sandarbha, a pioneer work that presents the Srimad-Bhagavatam not only as a bona fide Maha-purana, but also the topmost scripture. Therein he refutes several objections against its authenticity. In the 17th century some peculiar papers were composed: defending the Vaisnava’s view, Ramasrama, son of the famous Bhattoji Dtksita, wrote the Durjana-mukha-capetika CA Slap on the Face of the Wicked); to refute it, Kasinatha Bhatta compiled the Durjana-mukha-maha-capetika CA Big Slap on the Face of the Wicked); and another response written by an anonymous author is called Durjana-mukha-padma-paduka CA Lotus like Shoe on the Face of the Wicked). 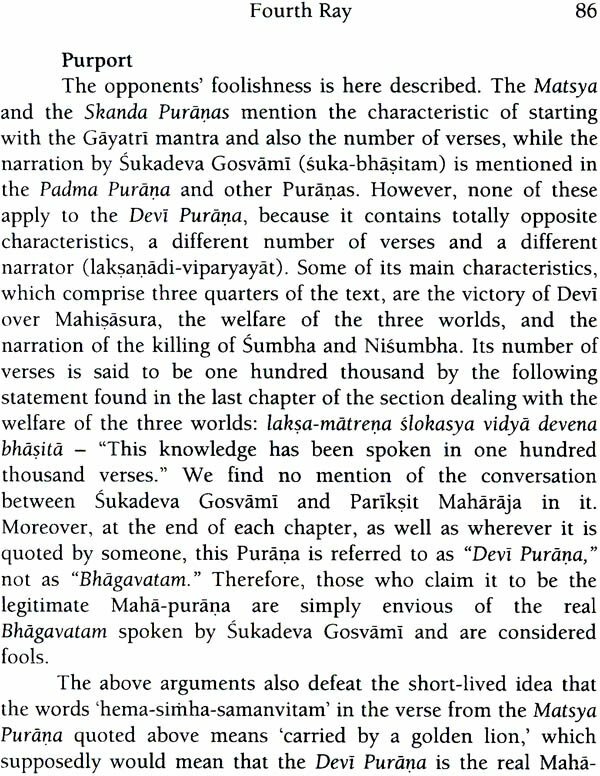 The discussion goes on to the present day, and unfortunately for the Saktas, on the basis of the large amount of evidence available, the great majority of scholars agree that the Vaisnava Srimad-Bhagavatam is the legitimate Maha-purana. A few of these evidences are as follows.